Moon and North Korean leader Kim Jong Un on Friday pledged to end hostilities between the two countries. 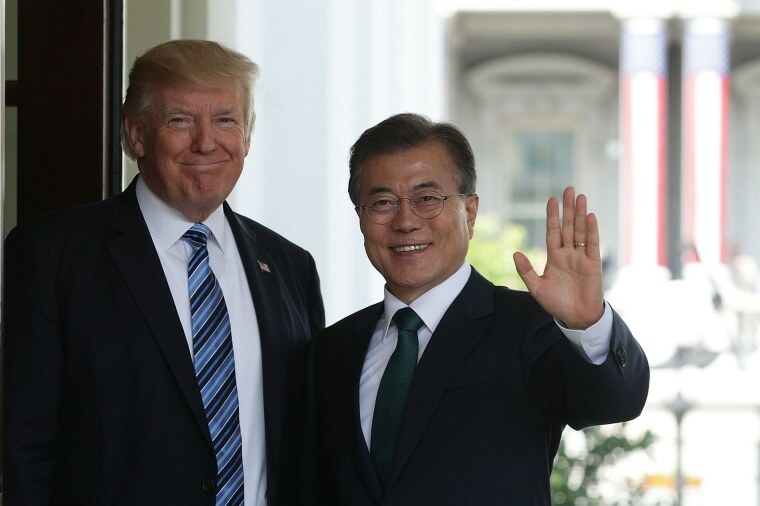 SEOUL — South Korean President Moon Jae-in said President Donald Trump deserves a Nobel Peace Prize for his efforts to end the standoff with North Korea over its nuclear weapons program, a South Korean official said Monday. Moon and North Korean leader Kim Jong Un on Friday pledged to end hostilities between the two countries and work towards the “complete denuclearization” of the Korean peninsula in the first inter-Korean summit in more than a decade. That upcoming meeting was the main subject of a private walk and chat that Kim and Moon had during their meeting at the border, the official said. Moon’s Nobel Prize comment came in response to a congratulatory message from Lee Hee-ho, the widow of late South Korean President Kim Dae-jung, in which she said Moon deserved to win the prize in recognition of his efforts, the Blue House official said. Kim Dae-jung championed the so-called Sunshine policy of engagement with North Korea, and won the 2000 Nobel Peace Prize after engineering the first inter-Korean summit with former North Korean leader Kim Jong Il. During Monday’s meeting, Moon called for a joint study with the North of economic projects that could be resumed without violating international sanctions imposed on North Korea for its nuclear weapons and ballistic missile programs. “The study is to set in motion the programs that are not subject to sanctions, while exploring what the two Koreas could do when the sanctions are lifted in the future,” the official quoted Moon as saying. The Trump administration has led a global effort to impose ever stricter sanctions on North Korea. Secretary of State Mike Pompeo said on Sunday that Trump would maintain a “pressure campaign” of harsh sanctions on impoverished North Korea until Kim scraps his nuclear weapon program.